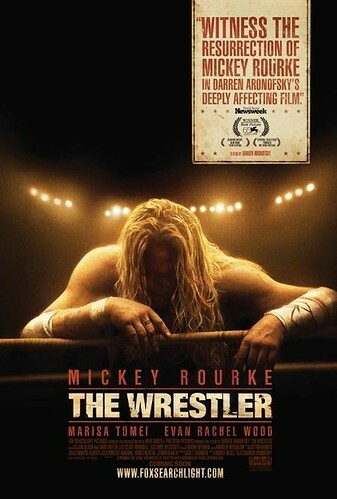 The Wrestler: 8 out of 10. I was blown away by Darren Aronofsky's Requiem for a Dream back in 2000. I was less impressed by his follow up, the awfully confusing The Fountain, but he strikes a near perfect chord with The Wrestler. It's super low budget and delightfully raw, but the success of The Wrestler lies squarely on the shoulders of Mickey Rourke. I don't know how he did it, but the Mickster played The Ram perfectly. He's a completely sympathetic character, despite being a natural born screw up. Due to the film's modest budget, Axl Rose donated the use of Guns 'n' Roses' "Sweet Child O'Mine" free of charge. It's The Ram's theme song, and just one nugget form the '80s you'll spot in this film. See it in all it's 8-bit glory. This and Slumdog Millionaire were my fave films of 2008. The ending reminded me of The Sopranos ending. Some people hate such open endings. I don't mind them. I actually thought it worked for The Wrestler. This movie was probably my fave of 2008 tied with religilous. Springsteen's soundtrack song is great. Mickey Rourke is the man. I think more big name actors will take chances like this on such movies. I'm going to add this to my list of roles that only the actor cast could have done. It would not have been as good if it had been anyone else other than Mickey.